Download "Lab 17: Consumer and Producer Surplus"
4 The total trade gain is dollars. 3. The Effect of Price Controls on Consumer and Producer Surplus Sometimes for the best motives, a government will interfere with the operation of the market process. For example price controls above the market can be imposed to insure the survival of marginal producers. The minimum wage and controls on cotton prices are two such examples. Also, prices can be kept artificially low. Rent control is an example of this policy. Select the box for price control to investigate these phenomena. 3.1 Use the price slider to select the controlled price p c to be higher than the market price. Notice that the producer surplus grows as the consumer surplus shrinks. Explain. 3.2 There is a new area on the screen that grows as the controlled price increases beyond the market price. This area (in yellow) represents the dead-weight loss (DWL) which is the difference between the total trade gain for the equilibrium price and quantity and the controlled price and quantity. The dead-weight loss is the loss in potential gains from all those transactions that never took place. On the graph (Figure 2) identify each of these areas. 6 (t x) = t ). In the short run, the marginal cost curve is quite close to the supply curve (because dx in the short run, suppliers are willing to produce up to the point where the price they will receive for an additional item is equal to their marginal cost.) Consequently on the tool you can see that as you move the tax slider t, the supply curve moves up or down by the amount t. 4.1 Select the unit tax t = $60/item. Label the areas in the graph shown in Figure 3. Identify the areas that correspond to the consumer surplus, producer surplus, dead-weight loss and the amount of money accrued by the government by means of the tax. 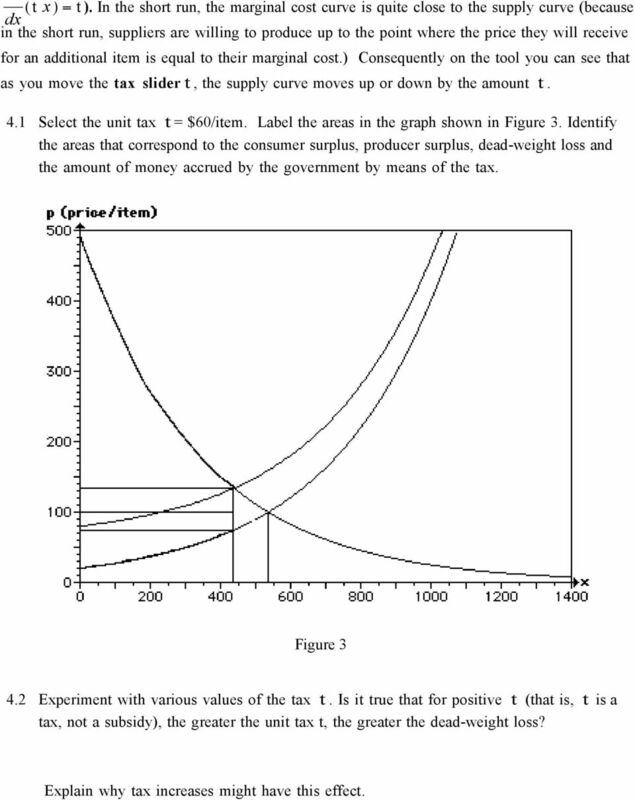 Figure Experiment with various values of the tax t. Is it true that for positive t (that is, t is a tax, not a subsidy), the greater the unit tax t, the greater the dead-weight loss? Explain why tax increases might have this effect. 7 4.3 Now try negative values for the unit tax t. A negative unit tax is called a subsidy. The government is paying the producer for each item producer. Note that the big rectangle that contains the equilibrium point is the amount of money that the government pays out. Also see that part of this rectangle is filled in with yellow when the tax slider is released. That area represents the dead-weight loss (as before). What does the dead-weight loss mean in this context? 5. 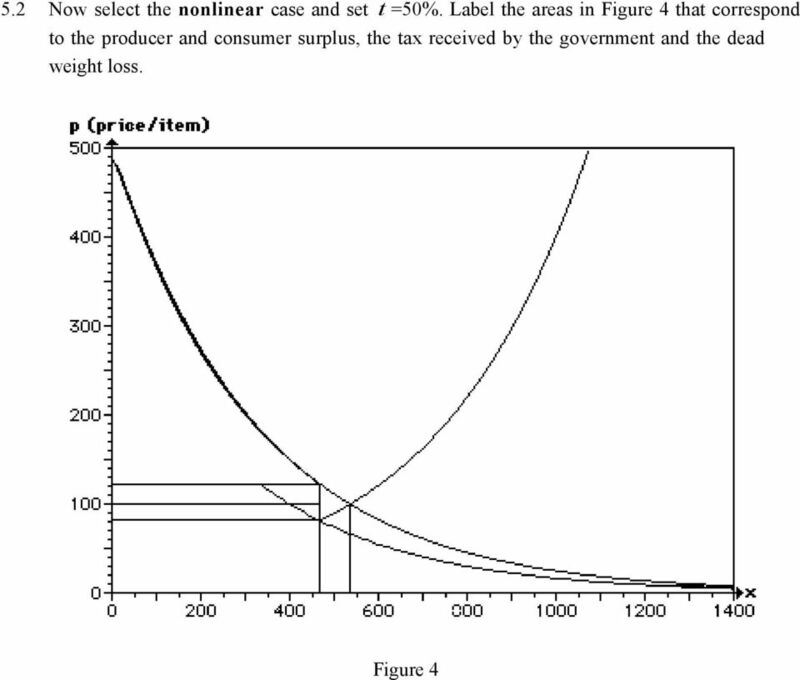 The Effect of a Sales Tax on Producer and Consumer Surplus A sales tax affects the demand curve as seen by the producers. 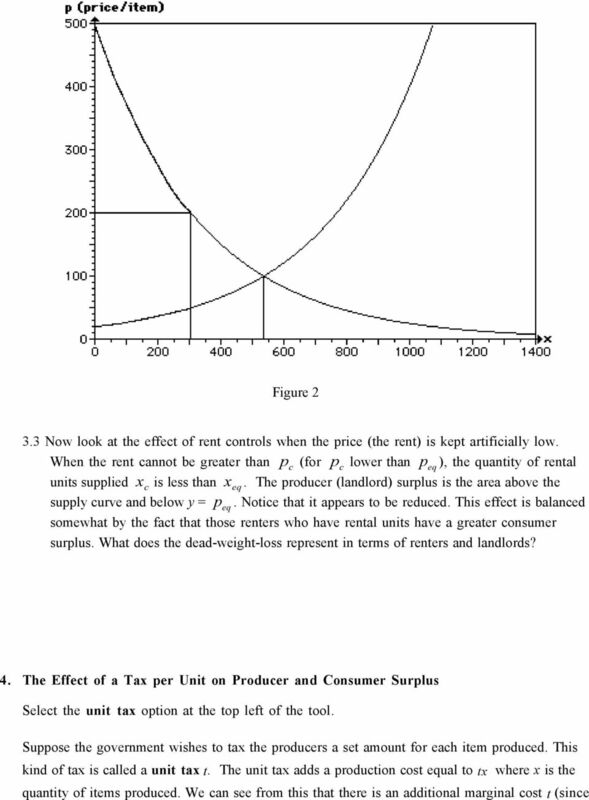 Note that the price per item that the consumers see is p consumer = p producer + tp producer which lowers their demand according to their demand curve p = D(x) and gives a net price to the producer of p producer = p consumer 1 + t = D(x) 1 + t (3) In effect the producers see a lower demand curve. 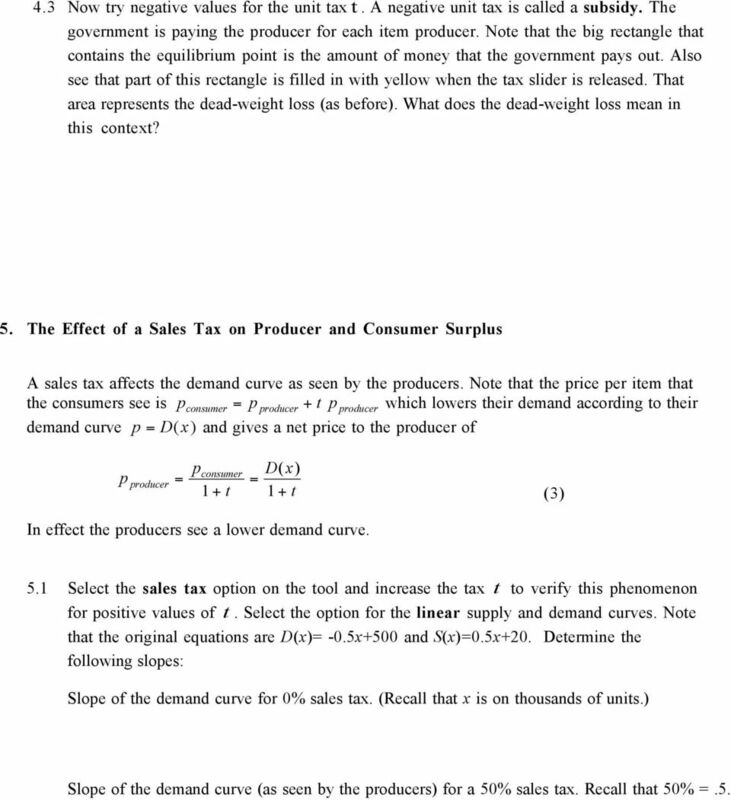 5.1 Select the sales tax option on the tool and increase the tax t to verify this phenomenon for positive values of t. Select the option for the linear supply and demand curves. Note that the original equations are D(x)= -0.5x+500 and S(x)=0.5x+20. Determine the following slopes: Slope of the demand curve for 0% sales tax. (Recall that x is on thousands of units.) Slope of the demand curve (as seen by the producers) for a 50% sales tax. Recall that 50% =.5. CHAPTER 11 MARKETS WITHOUT POWER Microeconomics in Context (Goodwin, et al. ), 1 st Edition (Study Guide 2008) Chapter Summary This chapter presents the traditional, idealized model of perfect competition. Review for the Midterm Exam. Q D = 100 - (5)(5) = 75 Q S = 50 + (5)(5) = 75. 7.5 SYSTEMS OF INEQUALITIES. Copyright Cengage Learning. All rights reserved. 3.3 Applications of Linear Functions A function f is a linear function if The graph of a linear function is a line with slope m and y-intercept b. The rate of change of a linear function is the slope m.
CH 7. Name: Class: Date: Multiple Choice Identify the choice that best completes the statement or answers the question. Class: Date: CH 7 Multiple Choice Identify the choice that best completes the statement or answers the question. 1. A price ceiling a. is an illegal price. b. is the price that exists in a black market. 1. Explain the law of demand. Why does a demand curve slope downward? How is a market demand curve derived from individual demand curves? How to measure the total economic well-being of a society? Page 1 of 9 Midterm Exam #1 Answers Instructions: Answer all questions directly on these sheets. Points for each part of each question are indicated, and there are 1 points total. Budget your time. 1. 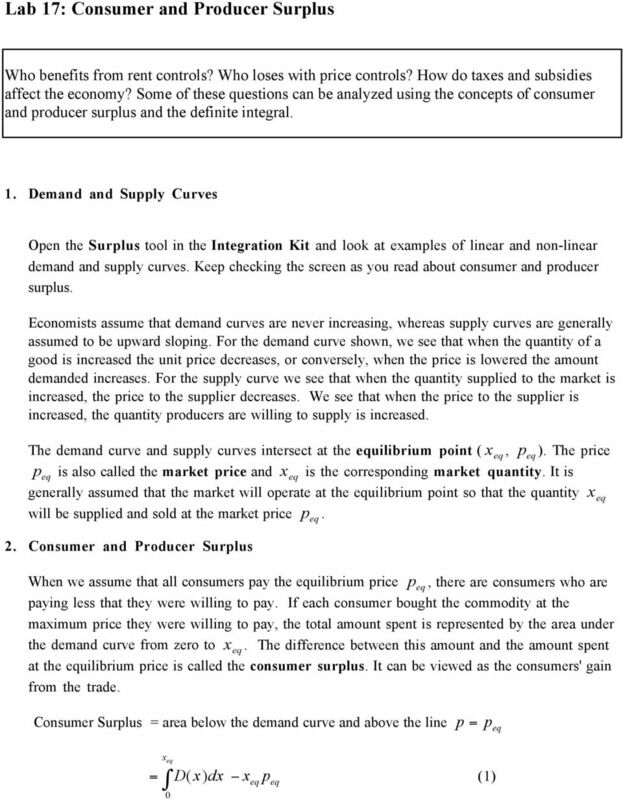 Chapter 14 DEMAND AND SUPPLY IN FACTOR MARKETS Key Concepts Prices and Incomes in Competitive Factor Markets Factors of production (labor, capital, land, and entrepreneurship) are used to produce output. In following this handout, sketch appropriate graphs in the space provided. Price per Bushel. 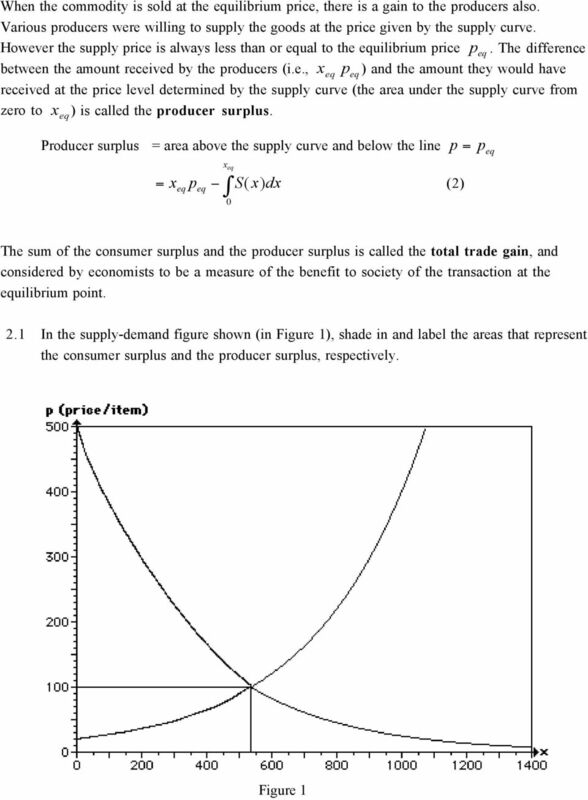 a. Graph the demand and supply curves in the figure below. Indicate the equilibrium price and quantity. 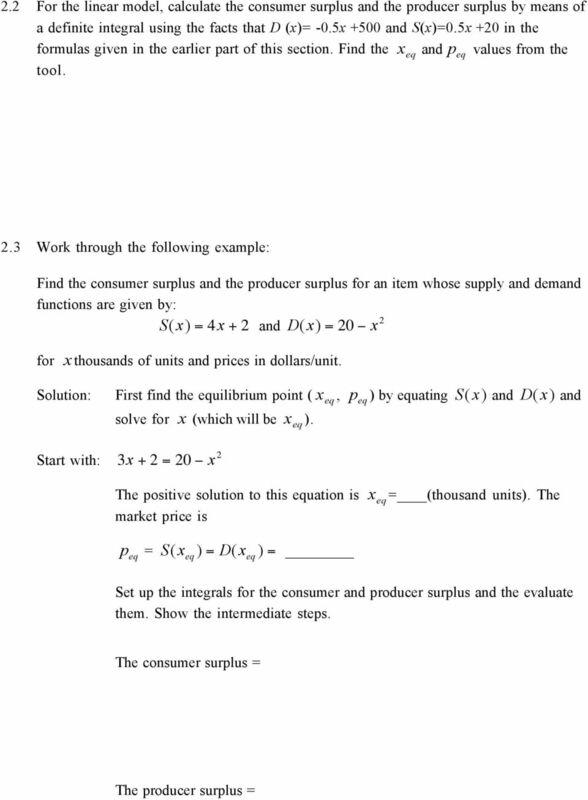 a) Find the equilibrium price and quantity when the economy is closed. CHAPTER 8 PROFIT MAXIMIZATION AND COMPETITIVE SUPPLY REVIEW QUESTIONS 1. Why would a firm that incurs losses choose to produce rather than shut down? Losses occur when revenues do not cover total costs. Consumers face constraints on their choices because they have limited incomes. Consumer Choice: the Demand Side of the Market Consumers face constraints on their choices because they have limited incomes. Wealthy and poor individuals have limited budgets relative to their desires. 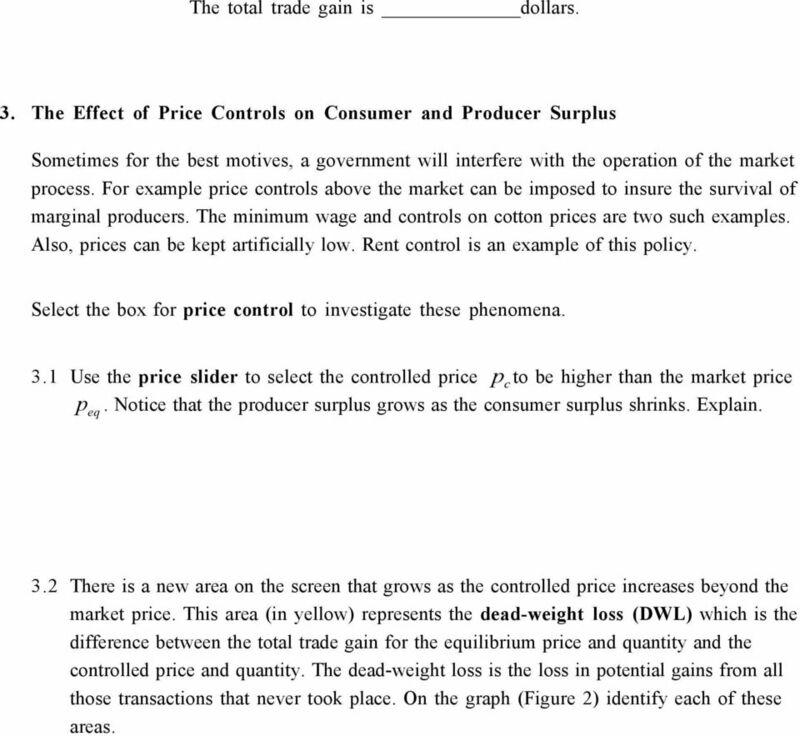 AP MICROECONOMICS 2015 SCORING GUIDELINES Question 1 10 points (1+5+1+3) (a) 1 point: One point is earned for stating that the firm s price is equal to the market price because the firm is a price taker. Tutorial 1. Monopoly and Price Discrimination. EXAM TWO REVIEW: A. Explicit Cost vs. Implicit Cost and Accounting Costs vs. Economic Costs: Economic Cost: the monetary value of all inputs used in a particular activity or enterprise over a given period. Chapter 6 Supply, Demand, and Government Policies Review Questions Using supply-demand diagrams, show the difference between a non-binding price ceiling and a binding price ceiling in the wheat market. Economics 101 Fall 2011 Homework #3 Due 10/11/11 Directions: The homework will be collected in a box before the lecture. Please place your name, TA name and section number on top of the homework (legibly). Chapter 12 Monopoly - Sample Questions MULTIPLE CHOICE. Choose the one alternative that best completes the statement or answers the question. 1) Unregulated monopolies A) cannot change the market quantity. Example 2: A company s car has an original value of $85, 000 and will be depreciated linearly over 6 years with scrap value of $10,000. Answer: TRUE. The firm can increase profits by increasing production. April 4th, 2014. Flow C was 9 trillion dollars, Flow G was 2 trillion dollars, Flow I was 3 trillion dollars, Flow (X-M) was -0.7 trillion dollars.